Universal Calibrating Machine - a versatile compression and tension machine used for the calibration of load cells, force gauges, crane scales and other force measuring instruments for the purpose of calibrating or characterizing the devices for use as secondary standards, working standards, or to make field measurements. Accuracy - The machine matches the accuracy of the calibration standard with which it is used. Most machines are aligned well enough that the maximum amount of side load is less than 0.0625 inches. On a shear web load cell this amounts to a possible error source of 0.003 %. 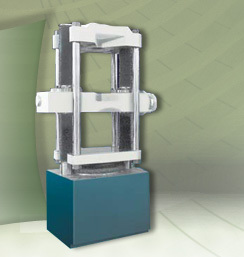 Range of Use - Typically a Morehouse UCM can be used as low as 1 % of full scale capacity. Universal Testing Machine - also known as a universal tester, materials testing machine or materials test frame, is used to test the tensile strength and compressive strength of materials. Accuracy - Most machines are between 0.3 % through 1 %. Errors less than 0.5 % are not uncommon. Very few labs can calibrate with devices sufficiently more accurate than 0.25 %. CMC - Calibration and Measurement Capability is typically above 1 %. 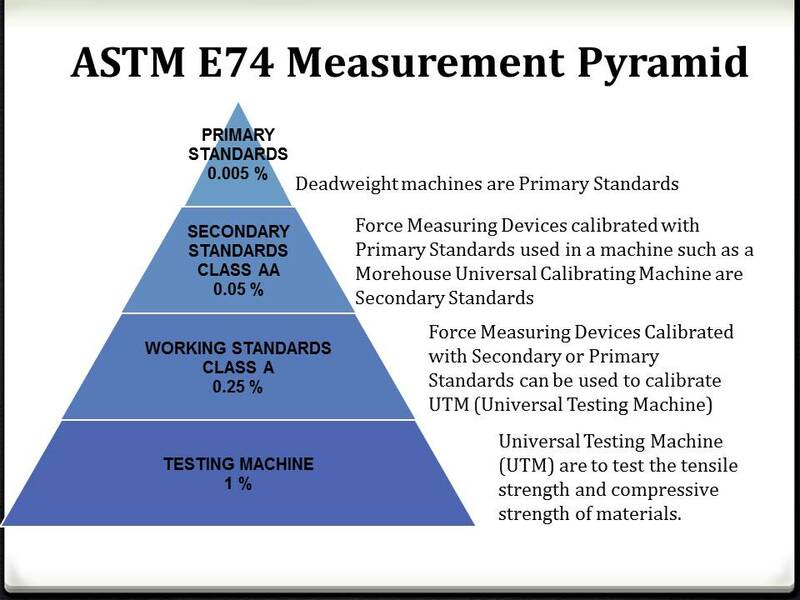 Note: A UTM may be used as a means to apply a force if a well defined reference standard, calibrated by primary standards is used in combination with the load cell in the frame (for control only), a CMC of 0.05 % may be achievable. Range of Use - Varies depending on the manufacturer.